It’s finally happening. The Flash is making up for giving that one episode its amazing name and then not following through with some violent primate punnery. Gorilla warfare is coming to Central City! We’ve got CGI gorillas in armor. We’ve got interdimensional travel. We’ve got the murderous Grodd, who... hey, does anyone else think Grodd turned really evil for a villain who was kind of on the line before? I get that he was probably angry about getting thrown into Earth-2, but I don’t know... I feel like he would’ve appreciated being around other super-intelligent gorillas more than he did. Maybe the other kids were mean to him or something. Look, this was a very interesting episode and it was a lot of fun, it propelled the season plot forward a bit at the end, and it’s pretty significant for a handful of the characters. But the star of this episode is whatever team does the visual effects work for The Flash. I wrote a bit about it for last week’s episode review, but I really want to state it this week: it’s extremely, extremely impressive that this show, on a regular television network like The CW, managed the level of visual effects that it did for the last couple episodes. When dealing with comic book shows like The Flash, I understand that productions have to budget realistically. The occasional monster here, the occasional bit of glowy doom-blast there — and with a show surrounding The Flash, especially, there has to be an allotment for zoomy effects. Lightning. Swooshing. Fire, occasionally. Blurry hands. I’m sure The Flash is expensive in the effects department on the average day, but to set aside two episodes in which The Flash fights against CGI gorillas? That’s putting up some big bucks. And they make it work, too. Sure, both “Attack on Gorilla City” and “Attack on Central City” skirt around a few minutes’ worth of animating frames by having the psychic gorillas psychically use human puppets to speak through, but — while initially comical, especially coming through Tom Cavanagh in the previous episode — there’s at least some story reason for doing it, too. Grodd likes using his psychic powers on humans as an intimidation technique (something that works amazingly well when he briefly takes over Joe in this episode — Jesse L. Martin is so talented that he can actually sell the Grodd Voice as scary) and a way to gain power in the human world. It makes sense. So, I just wanted to spend a little time in this review handing out kudos to the people behind the Grodd we see on screen. The job of making us, the audience, believe in the threat of a talking psychic gorilla on a bunch of superpowered people in a place as blandly named as “Central City” is not an easy one, and they managed it fantastically well. Is it Valentine’s Day again? There are hearts everywhere. Ugh, I don’t know. The timelines in all these shows vs. reality isn’t even that important — just remember, there are hearts everywhere. Romance is lingering. Cisco is sad about not having a girlfriend. Jesse and Wally are adorable together. These things all come into play at various moments in the episode. First up: Cisco’s lack of girlfriend! As soon as he says it, a breach opens up and Gypsy strides through. I’m sure Cisco thinks she’s been delivered to him by Cupid (not the villain one, the cherub one) but then Gypsy starts shooting red beams of doom at everyone in S.T.A.R Labs. My favorite moment of this little sequence is when Barry superspeeds out of the way of one of the beams and everything goes slow-motion, and we can see Iris next to him, nonchalantly backing out of the path of one of Gypsy’s beams. Iris is her own superpower. Gypsy is knocked out by Harrison Wells and locked up in one of the lab’s metahuman cells. When she comes to, she has no recollection of wanting to go on a killing spree on Earth-1, but Team Flash is now quite familiar with the powers and megalomania of a certain psychic gorilla, so Grodd is probably the culprit. Since Gypsy has the same breach-opening powers that Cisco has, they figure that she’s his way into Central City. The plan against Grodd relies heavily on Cisco’s ability to figure out when and where the gorilla and his gorilla army will be attacking. Also, although Cisco tries convincing Gypsy to fight with them (she does basically have the same powers as Cisco, so she’d be helpful) she refuses and returns to Earth-19. Cisco is sad. Anyway, the team seems to figure out where Grodd will be attacking and they go to the site to prepare, but nothing happens... until Joe turns his gun on himself and holy crap, show, please don’t scare me with the potential death of Joe West like that. Thankfully, Barry is able to save Joe as Grodd psychically forces him to fire at himself. A new plan (there are always more plans with these people) comes in the form of brain magnets and looking into Joe’s memories of being psychically linked with Grodd. Although Joe manages to draw a pretty decent portrait of the man Grodd is currently controlling, the team has no idea who the guy is... until they run the drawing through facial recognition software and learn that he’s a General in charge of missiles. Which are being launched. Ruh-roh! Barry stops the launch, but not the onslaught of super-gorillas. Despite having three speedsters and a Cisco on their team, our heroes are no match against Grodd’s army. But it’s Cisco’s turn to have a plan! He Vibes off to get Gypsy and both of them return with Solovar, who challenges Grodd in the classic gorilla way... and throws him off a building. Huzzah! But the fall doesn’t kill Grodd, and Barry stops Solovar’s killing blow because of... reasons, I guess? Because they might need to bring him back for a midseason finale in the next season? I don’t know. So I mentioned that it was Valentine’s Day and then a bunch of plot stuff, which seems pretty random other than the fact that Cisco’s crush on Gypsy was rather entwined with the main events of the plot. Romance was in the air for several other characters besides Cisco, though. Wally and Jesse are the most lighthearted and lovely little couple you’ve ever seen. Ignoring the drama surrounding Jesse’s chronically grumpy father, of course. Harry devises a little scheme, taking advantage of Wally’s naive nature to get him to reject Jesse’s plan to stay on Earth-1. By saying that he’s dying. Unfortunately for Harry, Wally is as chronically honest as Harry is chronically grumpy and he tells Jesse that her dad is sick. Also unfortunately for Harry, Jesse is not an idiot and immediately knows that her father is lying. Ha! 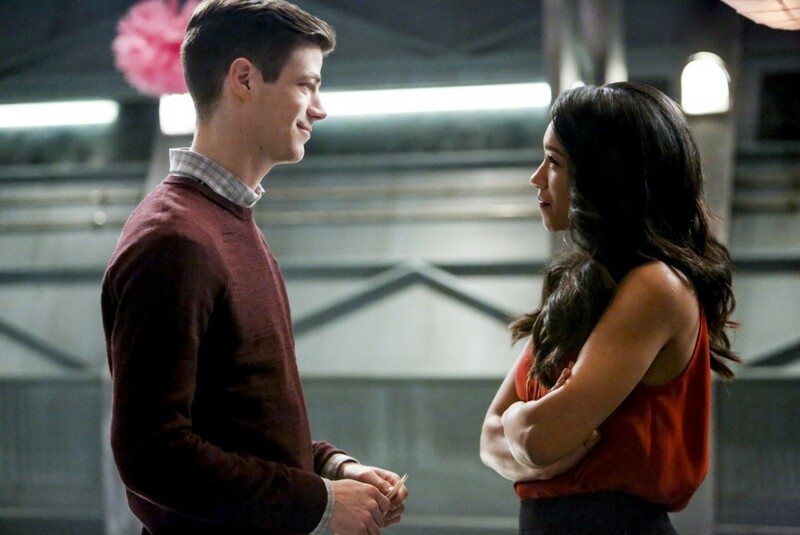 And the pivotal couple of the episode is, of course, Barry and Iris. Some of what Barry and Iris go through is a bit of pep-talking and soul-searching. While trying to come up with plans to fight Grodd, Barry thinks that maybe just killing the psychic, evil gorilla would be okay and I kind of agree with him, but Iris thinks doing that would forever alter Barry’s personality and what makes him a good hero. Yeah, nothing quite like that comic book black-or-white morality to make things confusing for everyone. But I do think it’s important how Iris’s discussion with Barry shows her faith in him. While Iris has had disappointingly little to do throughout the season despite half of it hinging on her possible demise, I do like that The Flash spotlights the Barry/Iris relationship as one of mutual faith. Barry believes in Iris more than anyone else. Iris believes in Barry more than anyone else. It’s probably the most balanced relationship in any of these comic book shows: there is no emotional drama, no secrets, no lies. Just two people who love each other and like each other. Which I guess is why, at the end of the episode, Barry drops to one knee and proposes to Iris West. The show cuts away before we can get an answer, though. Dangit. Also, Savitar is back. Double dangit. "Do you actually want any of this, or..." "Yes... and some of the food, too." Second episode in a row where Barry and Iris broke out some flirty double meanings. "You want to put a bunch of magnets against my skull to look into the mind of a psychotic, murderous ape." "Yeah." "... fine." Barry’s rambling story about where he got the engagement ring was very sweet. The pause after the proposal, indicating that Iris might say no or get kidnapped or something? NOT SWEET. Great review! I agree with you on every single point. Jesse sold Grodd to me more than Tom ever could.